Includes Two 32 ounce Extra Large Cup Jars with Two Screw Off Comfort Lip Rings. Fits Nutribullet 600 Watt and 900 Watt only. Does not fit any Magic bullet. The cups will NOT work with NutriBullet RX (1700 watts) or NutriNinja. Dishwasher Safe. We are in no way affiliated with Homeland Housewares. This is an aftermarket item made to fit Nutribullet Blender Juicer. 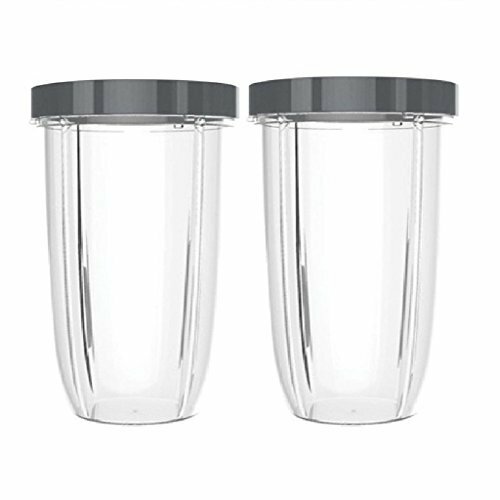 Two 32 ounce Extra Large Cup Jars with Two Screw Off Comfort Lip Rings. Fits Nutribullet 600 Watt and 900 Watt only. The cups will NOT work with NutriBullet RX (1700 watts) or NutriNinja.